By Jonathan Wood, M.D. and Linda Thomas, M.D. 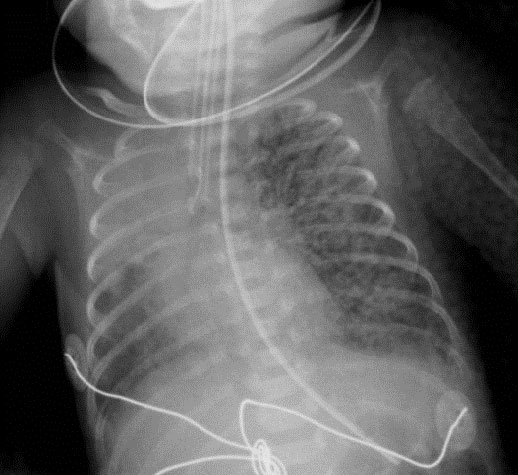 Neonatal ICU chest radiographs are one of the most common pediatric radiology examinations performed. As modern medicine has advanced, the lower age limit of viability has continued to decrease. Nowadays, it is not uncommon for 23-week-old infants to survive. Although there are many complications associated with prematurity, to include necrotizing enterocolitis, intracranial hemorrhage, and sepsis, the most common cause of neonatal morbidity and mortality remains lung disease. 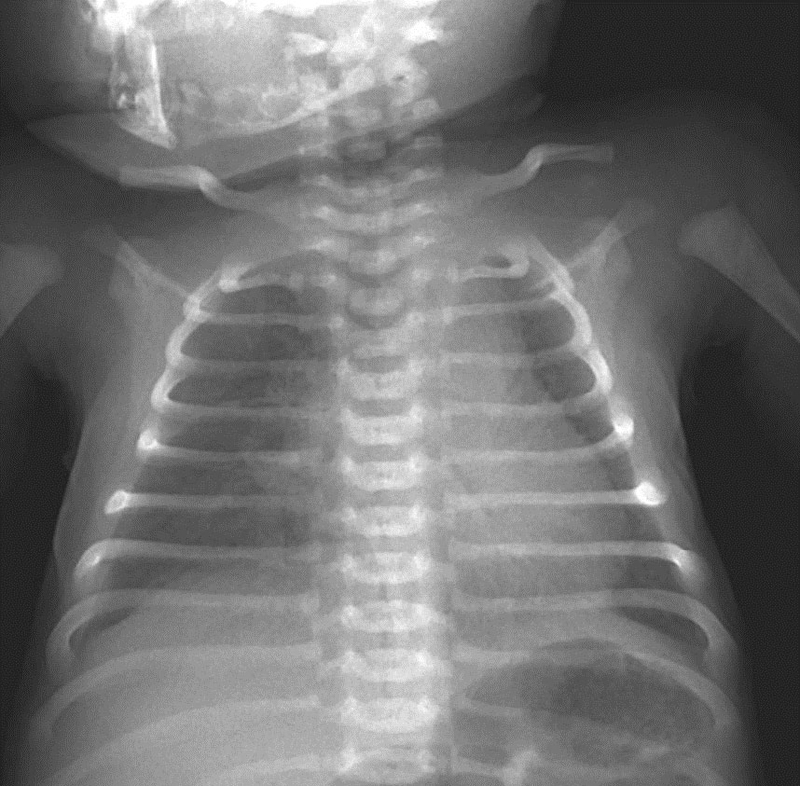 This article describes the pathology and radiographic findings of some of the most common lung disease encountered in neonates. Transient tachypnea of the newborn (TTN), also referred to as retained fetal lung fluid, wet lung disease, or transient respiratory distress, is caused by prolonged clearance of fetal lung fluid. Fetal lung fluid is not the same as amniotic fluid-rather it represents an ultrafiltrate of the fetal plasma. Symptoms of TTN include mild to moderate respiratory distress which presents at birth but may be delayed up to 6 hours. The symptoms typically peak within 36 hours after delivery and resolve by 72 hours. Common risk factors of TTN include precipitous deliveries and cesarean sections where it is thought that retained fluid is not fully expelled from the neonate's lungs as would occur during a normal vaginal delivery. Normally, 35% of fetal lung fluid is cleared in the first few days prior to birth secondary to increased gene expression for an epithelial sodium (Na+) channel. The rest is cleared by labor and postnatally during crying and breathing.1 Other risk factors include prematurity, maternal diabetes, hydrops and other forms of hypervolemia, maternal sedation, and a history of maternal smoking. Radiographic findings of TTN often include hyperinflated lungs and retained fluid within the alveoli and interstitium, to include pleural and fissural fluid, as well as increased perihilar interstitial markings (Figs. 1 and 2). Severe cases may show alveolar opacities from the retained fluid. Radiographic findings can be similar to heart failure, although without marked cardiac silhouette enlargement. Imaging findings of TTN typically improve within 24 hours as the excess fetal lung fluid is either absorbed or expelled. Treatment of TTN is typically supportive with oxygen and maintenance of body temperature. As the fluid clears, the lung parenchyma may develop a reticulonodular appearance on radiographs. The fluid typically clears superiorly to inferiorly and peripherally to centrally, although this may be variable given patient positioning. Most cases of meconium aspiration occur during the distress of labor-however, in utero meconium passage and aspiration can occur secondary to fetal stressors, such as hypoxia and sepsis. These stressful events cause a vagal response by the fetus, leading to defecation. Clinically, infants may present with cyanosis, tachypnea, and tachycardia. Signs of respiratory distress are invariably present, including intercostal retractions and nasal flaring. If the neonate defecated in utero, ingestion of meconium within the amniotic fluid can result in a yellow or greenish appearance to the skin, nails, and urine. 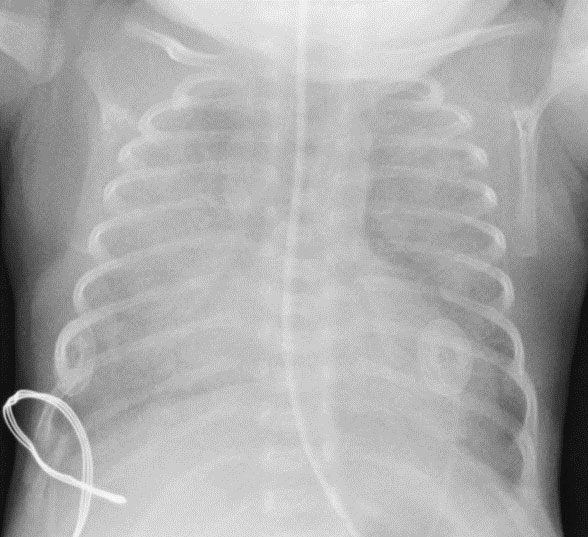 Aspiration of meconium results in airway obstruction with a ball-valve mechanism, chemical pneumonitis, and inactivation of surfactant by the bile salts, causing secondary surfactant deficiency.4 This complex pathophysiology results in a wide range of radiographic manifestations of the disease. 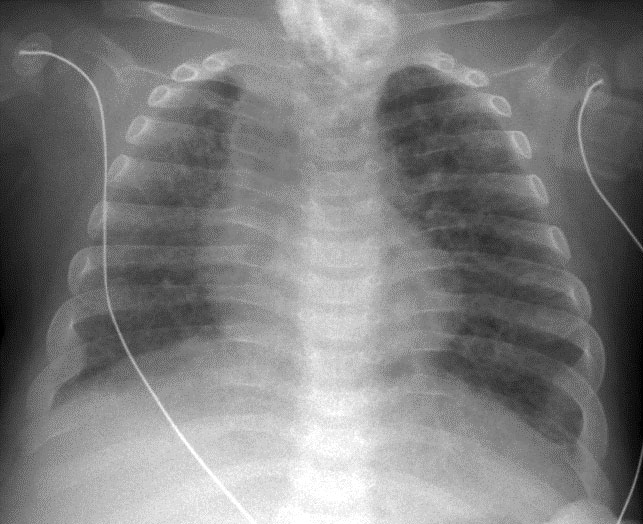 The most common radiographic finding is pulmonary hyperinflation secondary to the ball-valve mechanism of air trapping. Air trapping, in combination with the chemical pneumonitis, results in barotrauma which may cause pneumothoraces, pneumomediastinum, and pulmonary interstitial emphysema (Fig. 3). 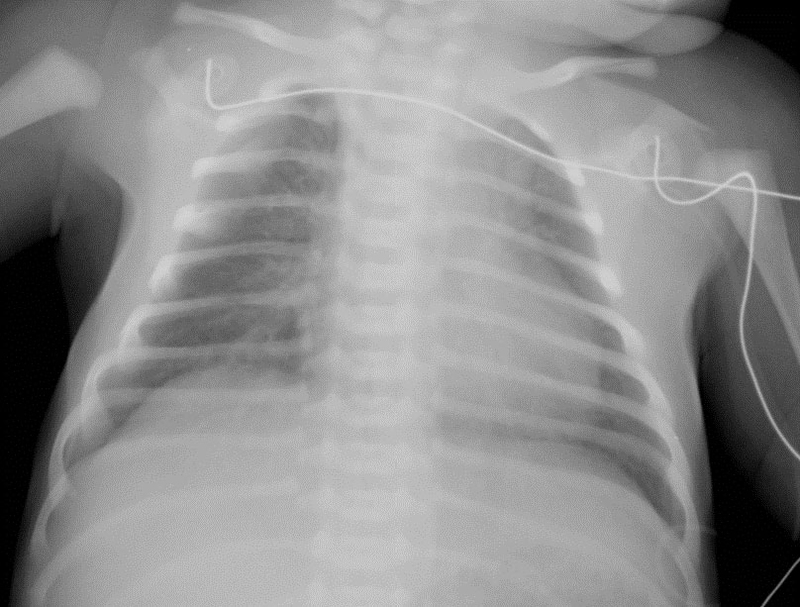 Other radiographic findings include perihilar ropey opacities and interspersed areas of atelectasis (Fig. 4). Pleural effusions can be seen but are uncommon. 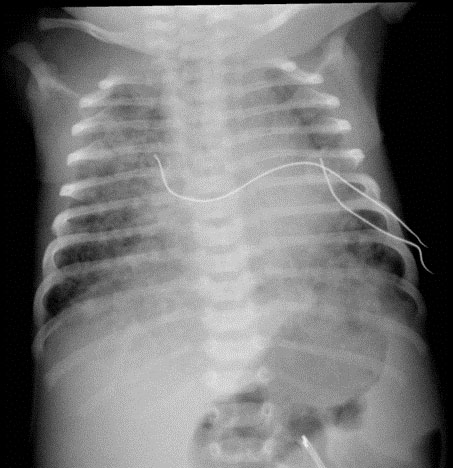 Meconium aspiration syndrome can result in persistent pulmonary hypertension of the newborn. Treatment includes endotracheal intubation to facilitate suctioning below the vocal cords, administration of surfactant to replace the surfactant inactivated by bile salts, and prophylactic antibiotics. 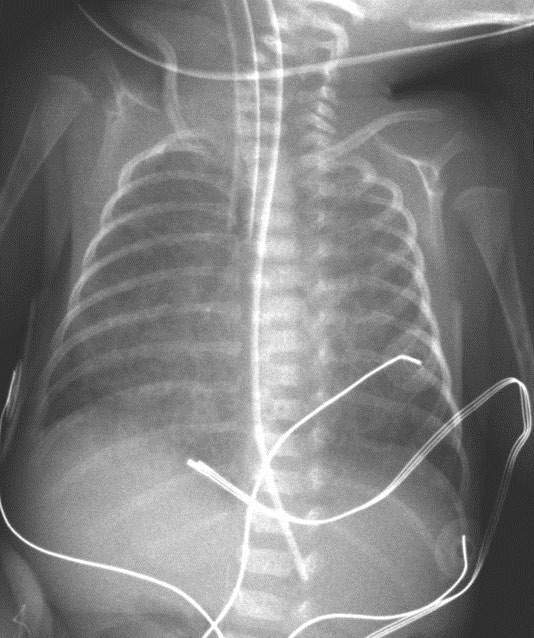 The radiographic manifestations usually resolve by 48 hours, although may take weeks if the meconium has a lower water content. Neonatal respiratory distress syndrome (NRDS) is the clinical term used to describe surfactant deficiency. It is also referred to as lung disease of prematurity. The term hyaline membrane disease is a histologic term and describes a byproduct of the disease. The incidence of NRDS is approximately 6 in 1000 births.6 Risk factors include prematurity, multiple gestations, oligohydramnios, and maternal diabetes. Maternal diabetes is thought to cause fetal hyperinsulinemia which interferes with surfactant biosynthesis, leading to NRDS. Boys and Caucasian babies are also at increased risk, for unknown reasons. The term hyaline membrane disease is derived from the appearance of hyaline membranes in the bronchiole walls. The hyaline membranes, which contain fibrin, mucin, and necrotic alveolar cells, are a byproduct of prolonged alveolar collapse. The lecithin to sphingomyelin ratio in the amniotic fluid is frequently used as a marker of fetal lung maturity. Fetal lung fluid flows into the amniotic fluid throughout gestation. At approximately 32 to 33 weeks of gestational age the lecithin content rapidly increases, indicating maturing fetal lungs and production of surfactant by type II pneumocytes. 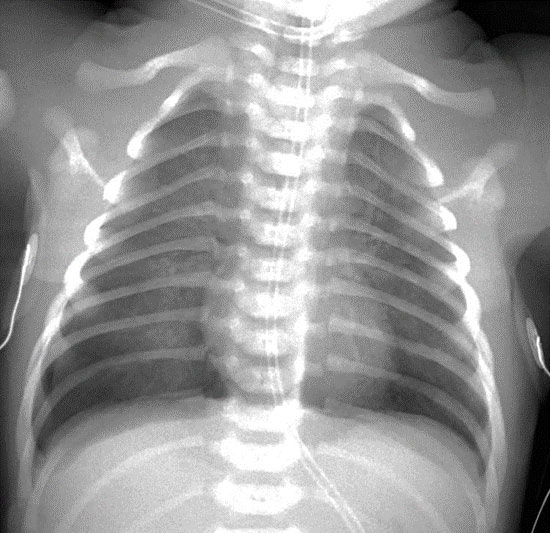 Radiographic findings in the setting of NRDS include stigmata of prematurity, to include a bell-shaped thorax and absence of humeral head ossification centers. The classic pattern of NRDS includes bilateral and symmetric granular opacities, air bronchograms, effacement of the pulmonary vasculature, and decreased lung volumes (Fig. 5). The classic appearance of NRDS is less commonly seen given the early administration of surfactant, frequently before baseline imaging is obtained, and tendency for early intubation. 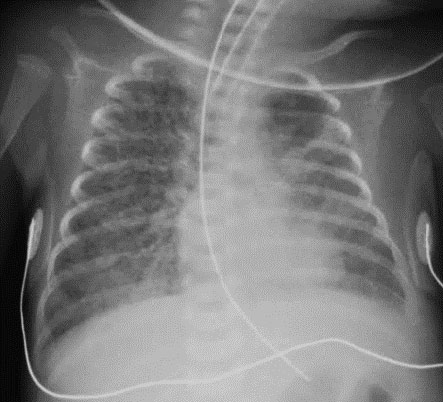 This results in appearances that can mimic meconium aspiration syndrome or neonatal pneumonia with increased lung volumes and focal areas of consolidation. Cystic lucencies from expanded parenchyma and asymmetric aeration can resemble PIE. If only a single lung receives surfactant, it may asymmetrically expand and cause mediastinal shift. Symptoms, which usually present in the first hours of life, include expiratory grunting and nasal flaring with possible cyanosis. Treatment includes exogenous surfactant administration and mechanical ventilation. If these therapies are not sufficient, extracorporeal membrane oxygenation (ECMO) can be used to allow the lungs to mature. Complications include barotrauma from mechanical ventilation and oxygen toxicity of the pulmonary parenchyma, as well as hemorrhage from surfactant therapy. There is significant morbidity associated with CPD secondary to increased incidence of reactive airway disease, infection, and pulmonary artery hypertension, which can result in cor pulmonale when severe. Current treatment is largely supportive with oxygen therapy and prompt treatment of pulmonary infection. The use of mechanical ventilation exposes the lungs to increased pressure, termed barotrauma, and over distention, called volutrauma, resulting in lung injury. Injury resulting in rupture at the junction of terminal bronchioles and alveoli, which allows gas to infiltrate into the perivascular and peribronchial spaces. This is referred to as pulmonary interstitial emphysema or PIE. There are two types of PIE, acute and persistent. acute PIE appears radiographically as “bizarre tubular and cystic lucencies” which may be focal or diffuse (Fig. 7). The term persistent PIE is reserved for PIE that lasts longer than 1 week. As with the acute form, it may be focal or diffuse. The cysts of persistent PIE have been described as being lined with multinucleated giant cells.6 Persistent PIE may be confused with other types of cystic thoracic chest masses in the infant. However, PIE can usually be distinguished from other cystic lesions, since it arises, occurs, and progresses in a ventilated patient. Management of PIE varies and includes high-frequency ventilation, placing the affected side of the chest down if the PIE is unilateral, and selective bronchial intubation to help spare the affected lung. Persistent PIE is managed conservatively, although focal cases can be resected if they are severe. If successfully treated, radiographic findings improve or resolve, depending upon the degree of improvement and underlying parenchymal injuries (Fig. 8). Neonatal lung disease remains one of the most common causes of morbidity and mortality in this patient population, especially in the setting of prematurity. 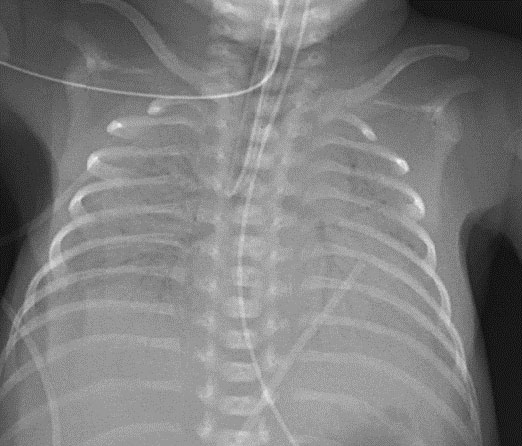 Neonatal chest radiographs play a critical role in the diagnosis, categorization, and management of the myriad of underlying neonatal lung diseases. 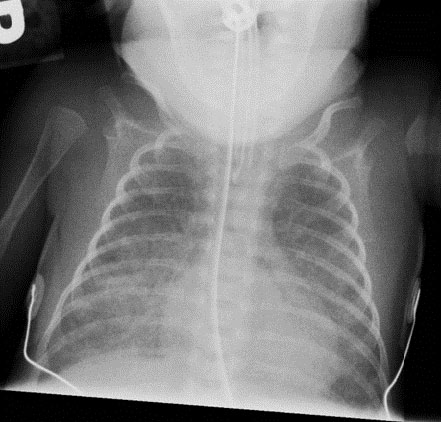 Therefore, it is critical that radiologists involved in interpreting neonatal chest radiographs be familiar with the imaging manifestations of common neonatal lung pathologies. This will allow for prompt and accurate characterization, as well as expedite and guide treatment. Guglani L, Ryan R, Lakshminrusimha S.Risk factors and management of transient tachypnea of the newborn. Pediatric Health 2009;3(3).251-260. Venkatesh V , Katzberg HD.Glucocorticoid regulation of epithelial sodium channel genes in human fetal lung. !m J Physiol 1997;273.L227. Jimenez E, Marin ML, Martin R, et al.Is meconium from healthy newborns actually sterile? Res Microbiol 2008;159 (3).187-193. Janssen DJ, Carnielli VP, Cogo P, et al.Surfactant phosphatidylcholine metabolism in neonates with meconium aspiration syndrome. J Pediatr 2006;149(5).634-9. Singh S, Clark RH, Powers RJ, et al. Meconium aspiration syndrome remains a significant problem in the NICU: Outcomes and treatment patterns in term neonates admitted for intensive care during a ten-year period. J Perinatol 2009;29(7):497-503. Agrons G, Courtney S, Stocker J, et al. From the Archives of the AFIP, Lung disease in premature neonates: Radiologic-pathologic correlation. Radiographics 2005;25(4):1047-1073. Dinger J, Schwarze R, Rupprecht E. Radiological changes after therapeutic use of surfactant in infants with respiratory distress syndrome. Pediatr Radiol 1997;27:26-31. Lyon A. Chronic lung disease of prematurity: the role of intrauterine infection. Eur J Pediatr 2000;159.798-802. Theilen U, Lyon AJ, Fitzgerald T, et al. Infection with Ureaplasma urealyticum: Is there a specific clinical and radiological course in the preterm infant? Arch Dis Child Fetal Neonatal Ed 2004:89(2);F163-F167. Northway WH, Rosan R , Porter DY. Pulmonary disease following respiratory therapy of hyaline-membrane disease: Bronchopulmonary dysplasia. N Engl J Med 1967;276:357-368. Swischuk LE, Shetty BP, John SD. The lungs in immature infants: How important is surfactant therapy in preventing chronic lung problems? Pediatr Radiol 1996;26:508-511. Campbell RE. Intrapulmonary interstitial emphysema: A complication of hyaline membrane disease. Am J Roentgenol 1970;110:449-456. Imaging of Neonatal Lung Disease. J Am Osteopath Coll Radiol. Jonathan Wood, M.D. and Linda Thomas, M.D. Dr. Wood works with the Department of Radiology, San Antonio Military Medical Center, Fort Sam Houston, TX and Department of Radiology, Cincinnati Children’s Hospital Medical Center, Cincinnati, OH; and Dr. Thomas works with the Department of Radiology, Cincinnati Children’s Hospital Medical Center, Cincinnati, OH.